An old news article is circulating around that states that 68 tons of fuel has melted in reactor number 1 and that it was close to breaching the bottom of the containment. The article is several months old but for some reason I have seen it pop up again on facebook so I though it is worth examining the article briefly. In particular I want to examine this statement. Only 37 centimeters of concrete remains between the fuel and the vessel's outermost steel wall in the most damaged area, TEPCO said. This wording is repeatedly used by anti nuclear sources to imply that a much worse disaster was very close to happening. What the articles fail to mention however is that there is A LOT more concrete between the ground and the molten core. The reactor building itself is a very thick concrete structure. Will Davis, on his excellent blog Atomic Power Review, talked about this the first time the news about the number one vessel failure showed up last November. Some of what he wrote is worth repeating and I hope he doesn't mind me repeating it here and also posting a picture from his blog. The NHK report indicates a melt depth of about 2.1 feet(64 cm, my note /Johan). The distance to the ground is roughly eighteen times this depth from the dry well interior floor to grade. 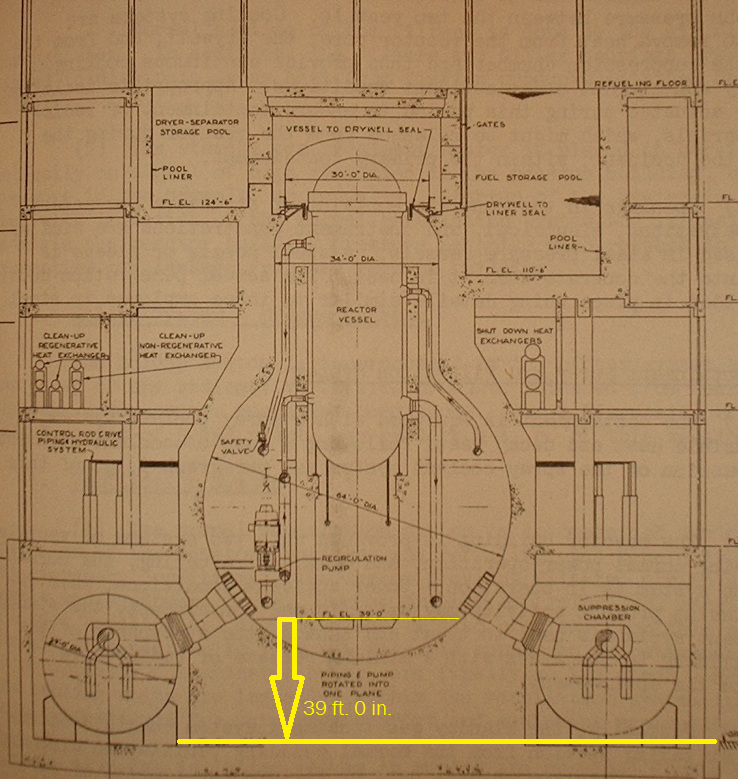 Below is a drawing from WASH-1082 which I've marked to show the distance from the dry well floor to the grade outside, which on the particular plant shown is 39' 0"(11.8 meters, my note /Johan). I do not presently know the exact measurement at Fukushima Daiichi No. 1 but it is likely within ten percent of this measurement... meaning that in the worst case that TEPCO is describing, by its own data, the core material may have melted only about as much as 5% of the distance to the grade. I encourage everyone to read the rest of his blog as it is by far the best information source for the Fukushima accident. I also want to add this picture of the mark I containment that schematically shows the thick concrete even more clearly! Picture found at the blog "The capacity factor". So we see that there is a tremendous amount of concrete below the shell of the containment structure. The hints and suggestions that the core would only have to melt another 37 centimeters for a unnamed disaster to take place is obviously false. In reality the shell of the containment is integrated into a thick concrete structure and the molten core would have to melt through several more meters, likely around 10 meters, to get out of the reactor building itself. The cleanup of the containment is going to be a very hard and messy job, much worse than the cleanup of TMI was. But the core is still a long long way from the ground. Just a short update for today. The number 2 turbine building basement is filling up with water as quickly as TEPCO is pumping it out. No word is said about how the similar work in number 1 and 3 is proceeding. Temperatures are on a downwards trend in all reactors. Pressure in the number 1 pressure vessel continues to climb slowly, containment pressures are stable. Not much new happening on that front. The Japanese Nuclear Society has reported that their analysis shows that parts of the fuel of all 3 reactors has melted and dropped down to the bottom of the vessels. Small parts of molten fuel has according to their analysis dropped from the rods, solidified when hitting the water and then sunk to the bottom forming small grains. The grains are easily cooled since they have large surface area to volume ratio and they don't form a geometry that is prone to re-criticality. They also state it is unlikely that there is a large amount of molten fuel at the bottom due to the low temperature readings in the bottom head. Nothing really surprising there either and I pointed it out some time ago. None of this is really surprising. Zeolite containing sandbags have been put outside the water intake for the number 2 reactors. Zeolite is a porous material that readily adsorbs different molecules (adsorbption is the process of molecules sticking to the surface layers of a material, as opposed to absorption that means its sucked into the material itself). It was used to clean contaminated water within the TMI power planet after the meltdown there. TEPCO has ordered storage tanks from the US to use to store radioactive water in. IMO I think TEPCO is trying to do perfect when perhaps they should think about doing things adequate. It seems like the volume of water is so large that temporary solutions, like erecting temporary pools, should be considered. But then again it is always easy to be an armchair quarterback on opposite side of the Eurasian continent (other seems to share my general idea though). I haven't seen any new published analysis of the radionuclide content of the water in the number 2 basement, it would be interesting to see what it contains. The dose rates from the water should be going down due to the I-131 decay. Over 95% of the I-131 has decayed now. Nitrogen injection into the number 1 containment continues, but pressure in the containment has stabilized. Meaning there must be a leakage somewhere. The leakage can't be very large however. Gamma dose rates are measured daily in all 47 prefectures. The values tend to decrease over time. For Fukushima, on 13 April a dose rate of 2.0 µSv/h was reported. In the Ibaraki prefecture, a gamma dose rate of 0.14 µSv/h was reported. The gamma dose rates in all other prefectures were below 0.1 µSv/h. Dose rates are also reported specifically for the Eastern part of the Fukushima prefecture, for distances beyond 30 km from Fukushima-Daiichi. On 13 April, the values in this area ranged from 0.2 to 26 µSv/h. In addition to the 7 measurements referred to in yesterday's brief, (note- these measurements were made at distances of 25 km and 33 km not 32 km and 62 km as reported), 13 more measurements were made on 12 April at distances of 25 to 33 km, West and Northwest from the Fukushima Nuclear Power Plant by the IAEA team. At these locations, the dose rates ranged from 0.5 to 16.5 µSv/h. At the same locations, results of beta-gamma contamination measurements ranged from 0.05 to 2.1 Megabecquerel/m2. Analytical results related to food contamination were reported by the Japanese Ministry of Health, Labour and Welfare on 13 April that covered a total of 98 samples taken on 4 and 11 to 13 April. Analytical results for 76 of the samples of various vegetables, pork, seafood and unprocessed raw milk in nine prefectures (Chiba, Fukushima, Gunma, Ibaraki, Kanagawa, Miyagi, Niigata, Saitama and Yamagata) indicated that I-131, Cs-134 and/or Cs-137 were either not detected or were below the regulation values set by the Japanese authorities. In Fukushima prefecture on 11 April, twenty samples of various vegetables were above the regulation values set by the Japanese authorities for Cs-134/Cs-137, and one sample of seafood (sand lance) and one sample of spinach were above the regulation values set by the Japanese authorities for both I-131 and Cs-134/Cs-137. All things Nuclear What Happened at Fukushima Dai-Ichi? Rättvisan framför allt Långsiktighet, var god dröj. In Your Face Kan du vika tranor? "We don't actually need nuclear power, because we could potentially use other clean sources of energy". I am not going to argue against that particular statement, because it is true. We could potentially rid ourselves of nuclear power and have clean energy from other sources. There are a few implications and practical matters that must be addressed though. So let's take this kind of reasoning a few steps further. What other areas is this statement true for? What more could we potentially be without? Do we actually need any of these?